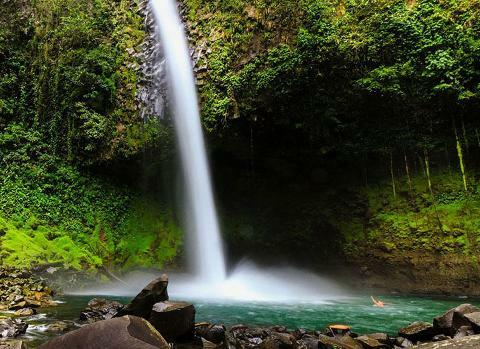 The La Fortuna Waterfall is one of the best things to see when you come to the Arenal Area! You will love the hike down to this waterfall near the town of La Fortuna because you can see all of the natural beauty of the rainforest as well as the birds and wildlife that live there. Once you arrive to the La Fortuna Waterfall, prepare to be blown away by the beauty of this impressive waterfall near the Arenal Volcano! You will also be able to swim and take amazing photos! 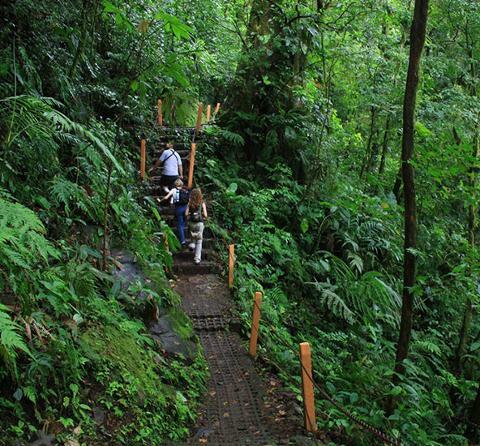 This popular attraction on TripAdvisor's "Top Things to do in La Fortuna" is great for the whole family. 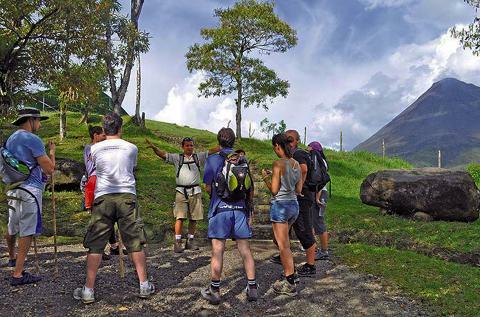 And Desafio makes it easy for you to enjoy this beautiful nature reserve and go hiking in Arenal. One of our friendly nature guides will pick you up right from your hotel and take you on a fun drive up a country road that leads past views of the extinct volcano known as Cerro Chato. You'll be able to snap great photos of the Arenal Volcano and the Cerro Chato Volcano (also known as the "Sleeping Indian.") Your nature guide will probably tell you some interesting trivia about the Cerro Chato Volcano and the indigenous communities that inhabited this area. 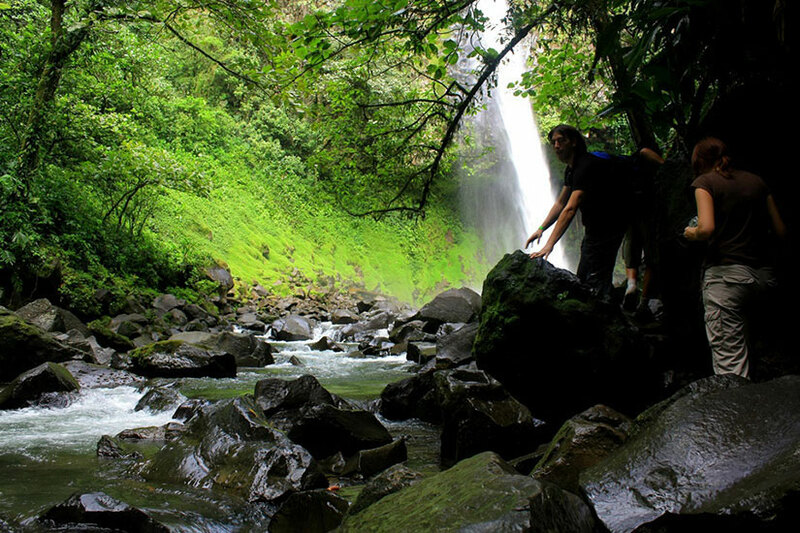 You will then reach the entrance area of the La Fortuna Waterfall. The La Fortuna Waterfall is a private nature park supported by the local government and proceeds from the entrance fee go directly to a variety of important public works projects in the La Fortuna area, such as the construction and management of a Multi-Sport Complex and an advanced wastewater management facility. Once you pass through the gates of the La Fortuna Waterfall entrance, you will cross a long suspension bridge that takes you above the La Fortuna River canyon. You will then get to an area with newly-remodeled restrooms, showers and restaurant. There is a look-out platform from the top of the waterfall where you can get your first glimpse of the breath-taking 150-ft La Fortuna Waterfall. You will then head with your guide down to this famous waterfall. Get ready because there are 500 steps to get down to the waterfall and of course 500 steps to get back up! 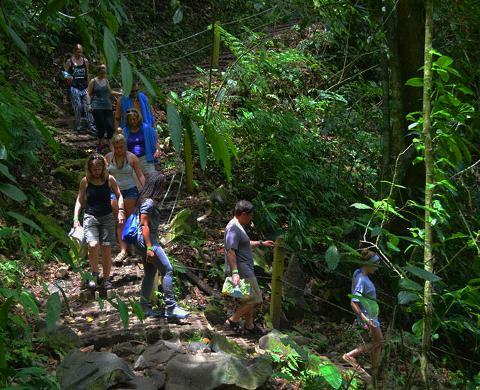 Many people take breaks on their way to soak up the lush rainforest, tropical birds and variety of wildlife that you may be lucky enough to see. When you reach the bottom, you will be blown away by the beauty of this towering waterfall and have plenty of opportunities to relax on the rocks and admire the views. You can also take a swim in the cool, refreshing clear-water pools along the left-hand side of the waterfall. Be sure to ask your guide to keep an eye on your belongings while you are in the water. When you are ready, take your time and head back up to the top. You can rinse off in the showers and change into dry clothes and take part in a delicious tropical fruit snack with your guide. When you're ready, jump into our Desafio Adventure van and head back to your hotel. For us, this is definitely one of the most-beautiful waterfalls in Costa Rica and one of the best things to do in Arenal.